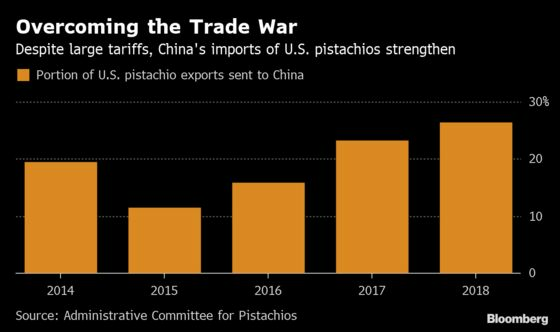 U.S. pistachio growers like Jim Zion braced for the worst last year when the nut got caught up in America’s escalating trade tensions with China -- complete with potential tariffs of as much as 45 percent. But that didn’t happen. U.S. pistachio exports to China rose 7 percent to a record 108 million pounds in the crop year through August, according to the Administrative Committee for Pistachios, and another 10 percent in the six months since. Turns out that a bit of luck -- the second-largest producer, Iran, had a bad crop -- coupled with the China’s big appetite for pistachios, sustained demand, price threat and all. The new tariffs on pistachios were announced in April as part of China’s retaliation to President Trump’s steel and aluminum levies, with additional taxes announced in June bringing the potential tariff rate to as high as 45 percent -- up from just 5 percent originally. There could also be more at play -- including lower-than-expected tariffs being collected. With China and the U.S. still in talks about potentially ending their trade war, China has since rolled back some U.S.-specific agricultural tariffs. China may also not be collecting the full tariffs while the talks on a potential deal are ongoing. Chinese President Xi Jinping on Thursday said the two sides had “reached new consensus” on issues like the text of a trade agreement, according to Xinhua. Trump said a deal was probably still weeks away.